Hello and happy Wednesday! 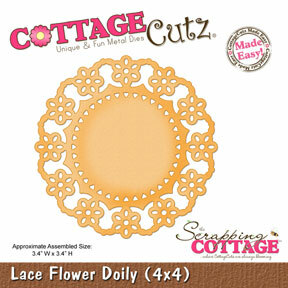 Today I have a fun little card that I made with CottageCutz dies from the Spring Blossom release at The Scrapping Cottage. These gorgeous dies just arrived in my mailbox yesterday, and I could hardly wait to get that package opened and start playing! I used some patterned paper from my stash, added some punched elements for the sentiment and embellishment. The wings of the bee have Stickles added to them for sparkle. Oh! I almost forgot! I sponged the edges of the doily and bee's wings with distress ink, as well as the body, using opaque white ink. You can see that by adding just that wee bit of sponging, it gives the die cut a much more 3-Dimensional look. 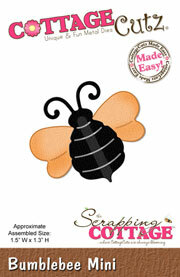 This Spring Blossom release has a lot of great dies lending endless possibilities for some truly amazing projects. Be sure to visit The Scrapping Cottage to check them ALL out! You'll be glad you did!!! Have a wonderful and blessed day, and Happy Stamping! Lorie, your card is adorable!